Ahh yes.... I've been away for a couple weeks on a road trip. Drove the southern part of B.C. through Kooteney/Banff/Yoho National Park, on to Calgary to check out the Calgary Stampede and back. 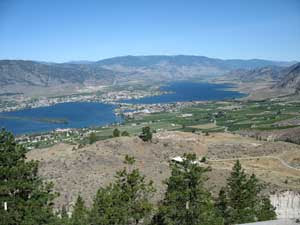 I believe the picture is of overlooking Osoyoos, heading east. This almost seems like blasphemy, but I didn't take my PSP. I didn't take any handhelds, only my Sandisk e280 mp3 player. I knew I wouldn't get a chance to use them very much. It was a hard decision to leave my beloved PSP at home, but I only had so much space. I did take a novel (Twilight) -- books: the original handheld-- but I didn't even get much of a chance to read that either. I shoulda taken the PSP. I didn't expect to find much has changed in the handheld world, or even with the Wii either. And unless I'm missing something, not much has. As far as I can tell, there's been the usual "PSP 2" rumours, and the odd PSN announcement, but nothing of note. I'm just spending the next couple weeks waiting for Wii Sports Resort to finally hit. Honestly, I think this may be my most anticipated game of the year. I don't know why I'm so psyched for it, it's not like it will be a deep immersive game. But Wii Sports was the killer app; I knew when I bought my Wii that Wii Sports alone was worth the price of admission for me. So if Wii Sports Resort lives up to that kind of accessible fun, then I'll be happy. Plus... it's such a dry season for games-- news and releases-- that anything is better than nothing. This would be a great time to release a blockbuster because I'd be much more inclined to pick it up now rather than the "holiday period" where there's so much more competing for my $$$.